MBO Blood Donation Campaign - Blood Connects Us All. Five years and going strong, MBO Cinemas and St John Ambulance of Malaysia (SJAM) returns with their annual blood donation drive. This campaign which is supported by the National Blood Bank and the Ministry of Health will be held at MBO Cinemas outlets nationwide. The theme for this year’s campaign – Blood Connects Us All - stresses on the importance of how Malaysians with different blood groups can be united through this single act of selflessness. This drive also aims to inspire Malaysians that share the same goal to help top up the depleting blood supply at the National Blood Bank, which usually tends to drop drastically before festive seasons and school holidays. Over the past four years, MBO’s Blood Donation Campaign has successfully collected close to 17,000 pints of blood and once again counts on its Malaysian customers and fans to come together as a community and contribute to the cause. 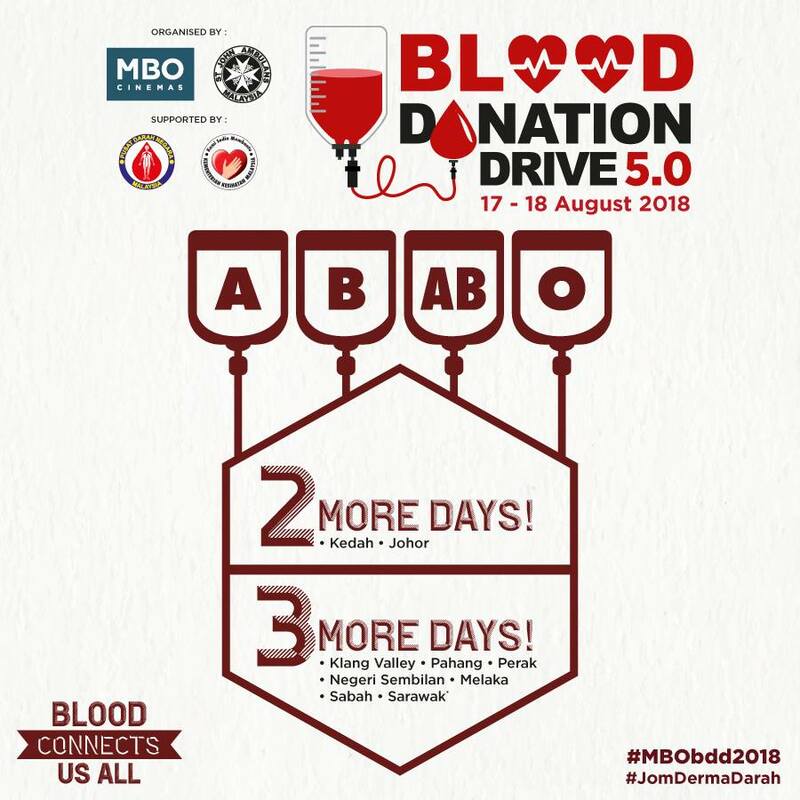 “Despite ongoing efforts to raise awareness for the need for more blood donations and drives around the country, the National Blood Bank is struggling to keep up demands and is facing a shortage nationwide.” said MBO’s General Manager of Marketing and Sales, Ms Jamie Tiong. “On that note, we are calling all Malaysians and Internationals to help us fill the blood banks for this year’s blood donation drive. Through their help and support, we are hoping to achieve the collection of 6,000 pints of blood at 25 MBO outlets nationwide.”, added Ms Jamie Tiong. According to Dr Noryati Abu Amin, Director at the National Blood, the demand for blood has drastically increased over the years because of three main factors, namely the rise in the number of patients, the increase in the development of medical technology and the increase in the availability of speciality hospitals in Malaysia. Blood banks need a constant supply of donations, as red blood cells can only last a maximum of 42 days, while platelets can only be kept for five to seven days. Plasma can be frozen and if kept in the right conditions, can keep well for years. The short lifespan of some components is the reason why the blood bank is constantly in need of supply. Also, despite a 25 percent of the population having blood type A, it often runs short in the blood bank. 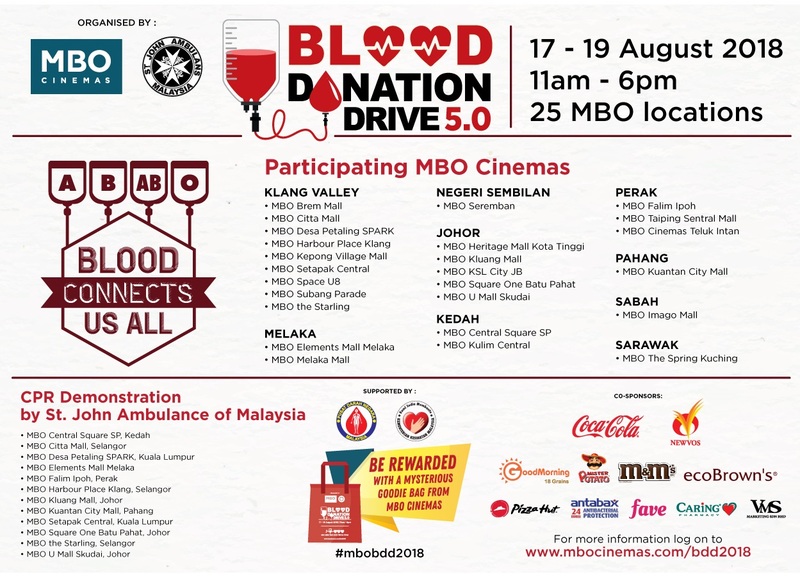 “Thanks to organisations like MBO Cinemas for their continuous commitment to organise an annual blood donation drive, 82,619 new donors have joined the cause nationwide as compared to 76,213 new donors recorded in 2016. This is a positive sign as the patients’ needs are being met under the Ministry of Health”, added Dr Noryati Abu Amin. An important message the campaign also tries to highlight is the importance of giving blood regularly so that the blood stock can be kept at sufficient levels before an emergency arises. Only 2.2% out of 30 million Malaysians donate blood – which is a far cry from the 3.5% – 5% recorded in more developed countries. On average, government and private hospitals in Malaysia need to prepare around 2,000 bags of blood to support the needs of 1,000 patients per day. “We are glad to co-organise this event with MBO Cinemas for the fifth year now. Over the years, we have seen many new faces and continue to receive support from the regular donors who never fail to come forward. We have faith that this annual collaboration will continue for years to come,” said Dato' Lai See Ming, Commander-in-Chief at St. John Ambulance of Malaysia. In conjunction with St John Ambulance’s 110th Anniversary in Malaysia, a free CPR training and demonstration exercise will be conducted in tandem with the blood donation drive to celebrate their formation in Malaysia which stretches back over a century. “Through this CPR training and demonstration exercise, we can educate members of the community on the proper way to perform CPR, so that they are capable of providing help and potentially saving the life of a person in need of CPR, especially of a loved one.”, added Dato' Lai See Ming. As a sign of gratitude to the donors, MBO will provide each donor with an exclusive goodie bag which includes MBO movie vouchers, snacks and a variety of vouchers from the generous sponsors of this year’s blood donation drive. The nationwide blood donation drive will be held on the 18th & 19th of August, from 11am – 6pm with the exception of Kedah and Johor where the dates will be the 17th & 18th of August from 11am – 6pm. The theme of this year's campaign is "Blood Connects Us All”.